3… N×h8 4.Bç6 Kb6! 5.Bf3!! 5.Bh1?,Kç7! 6.Kg7,Kd6 7.Kf6 (7.K×h8?,Ke5 -+) Kd7 8.Bd5,Kç7 positional draw. 5…Kç7! 6.Kg7!Kd6 7.K×h8 Ke5 8.Kg7! 8…,Kf5 9.Kf7!,Kf4 ( 9…,Ke5 10.Ķe7! 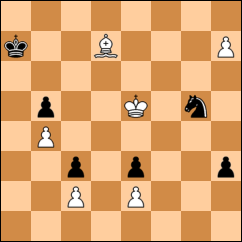 +-) 10.Kf6(e6),Kg3 11.Ke5(d5),Kf2 12.Kd4 similar to solution. Thematy Try;9.Kg6?,Kg3 10.Kf5,Kf2 11.Kf4 ( 11.Ke4?,h1Q 12.B×h1,K×e2 -+) h1Q 12.B×h1,K×e2 13.Bç6, Kd2 14. B×b5,K×ç2 15.K×e3,Kb3 Draw. 13.Bç6? ,Kd2 14.B×b5,K×ç2 15.K×e3,K×b3 Draw. 13…Kf2(d2)14.Bd3 e2 15.B×e2 K×e2 16.K×ç3 Ke3 17.Kb2!! 17.Kb3?,Kd4! 18.Kb2,Kç4 19.ç3, Kd5! Draw. 24…,Ke5 25 ç4, b×ç4 26 K×ç4, Kd6 27 Kb5,Kç7 28 Ka6(a5,ç5 ) Win. or 25…,Kd6 26 ç5(ç×b) Win. After 16…,Ke3 the study has been tested for soundness by the Nalimov tablebases (6m.) but these were not used during composition. Mes courses sont très géniales. On y va assez vite.